The SC's bold bulbousness gives it excellent desk presence. Seldom does a machine sit so perfectly tightly into its case. Yeah, these are good. I do like the action, and I think the skipping problem is fixable with some strategic "forming." None of my machines have been THAT bad but a friend of mine applied your theory to a very skippy Silent and we saw some significant improvement. I love my '56 Silent Super. Definitely a great machine to write with. Snappy and solid. Based on how nicely this one types, I'm tempted to go for a Skyriter due to its sleeker profile. And yes, I have a '46 Royal QDL which does have a tendency to join words together, but I think I've figured out that it's to do with typing speed rather than anything else. If the skipping is always the same key, I've fixed some Skyriters by bending / unbending the place the typebar contacts the universal bar. Richard P. has a post on it. 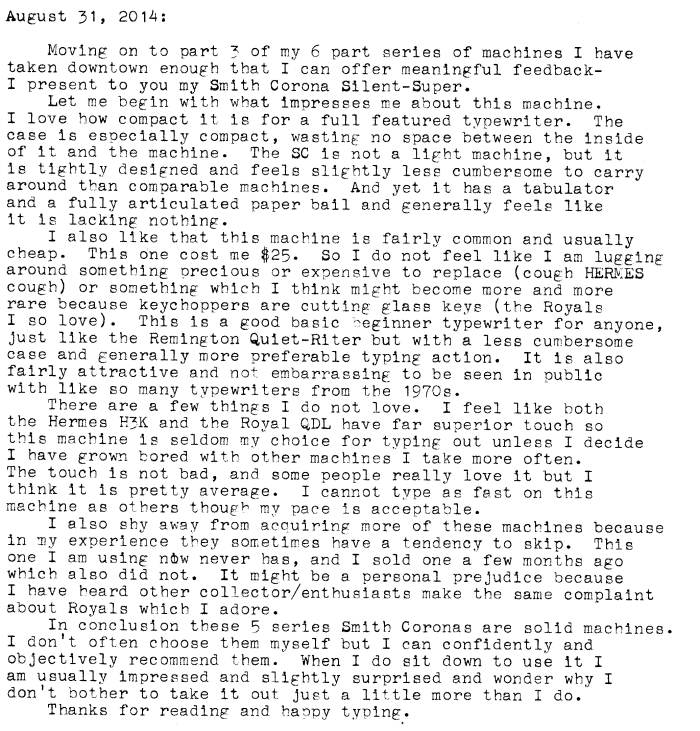 I have yet to add any of this series Smith-Corona machines to my collection, but that may soon change. I always read good reports on them.